I said that one day I was going to make Falafel from the over abundance of dried garbanzo beans I have from my CSA box. Well I finally did it last week and it wasn’t nearly as bad as I thought it was going to be. It was a bit messy, but then again, it could be that I’m a messy cook so it doesn’t matter what I make it’ll still be a mess. First I took about 2 cups of dried garbanzo beans and covered them water leaving about 2 inches or so of water over the beans and let them soak overnight. Trust me, you want to use dried garbanzo beans, if you don’t, you’ll end up with hummus. I used this recipe from Tory Avery, it seemed to be the most authentic. She had some great pictures and good tips for a first time falafel maker like me. It definitely was not a fail. Form little balls or patties . 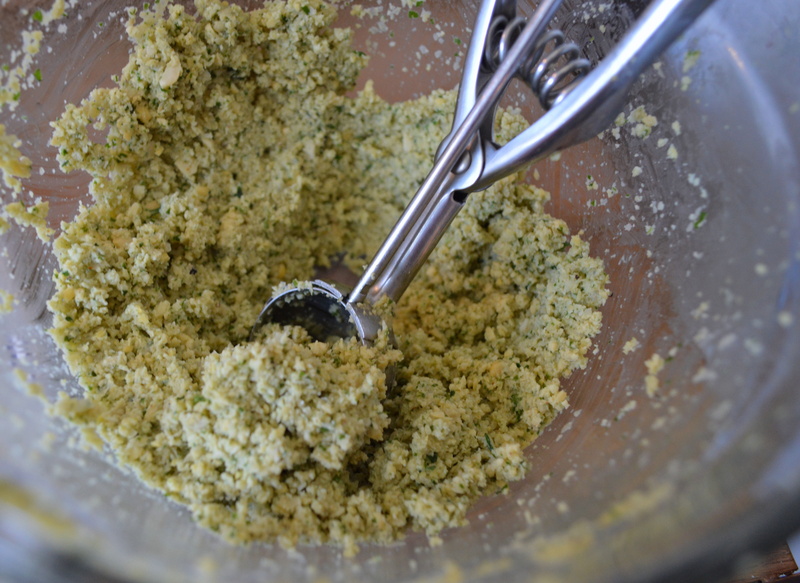 I used a cookie scoop, which was about 2 tablespoons of falafel mix. Form little balls into patties. 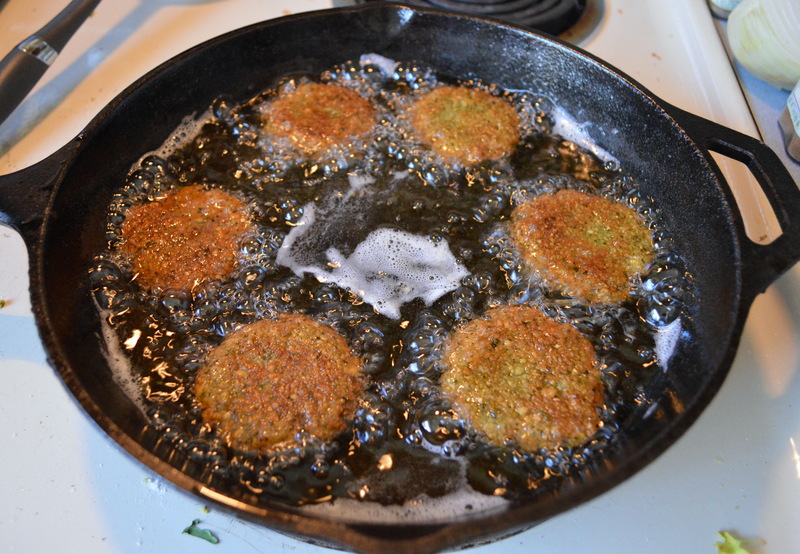 Carefully drop falafel patties into hot oil. Serve in pita bread half with your choice of condiments. I used tzatziki, chopped tomatoes and lettuce. 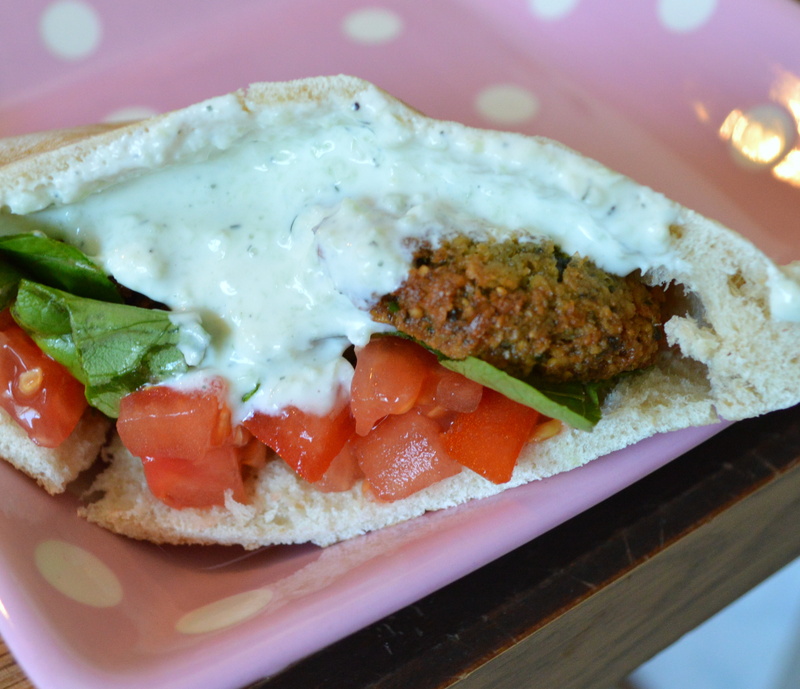 Keep it simple to get that great falafel flavor. Drain and rinse the garbanzo beans. Place in a food processor along with the onion, garlic, flour, salt, cumin, coriander, black pepper and cayenne, cardamom and herbs. Pulse until the mixture starts getting a bit coarse, scraping down the sides periodically. Pulse a bit more until you get a meal like consistency. I pinched a bit between my fingers and if it held it’s shape then it was good. I probably chopped it up a bit more fine than called for, but the falafel patties held together beautifully. Pour into a bowl and use a fork to loosen and fluff up the mixture. Cover and chill for at least an hour. The longer the better. In a skillet or pan with high sides heat about 1 inch of oil. Form the falafel mixture into little balls or patties. I used my cookie scoop and came up with about 2 tablespoons or so of mixture for each patty. Carefully place the patties in the hot oil, I dropped them in away from me so I didn’t get splattered. Fry about 5 or 6 at a time, about 2 minutes on each side. I used a cast iron skillet and it worked perfectly. 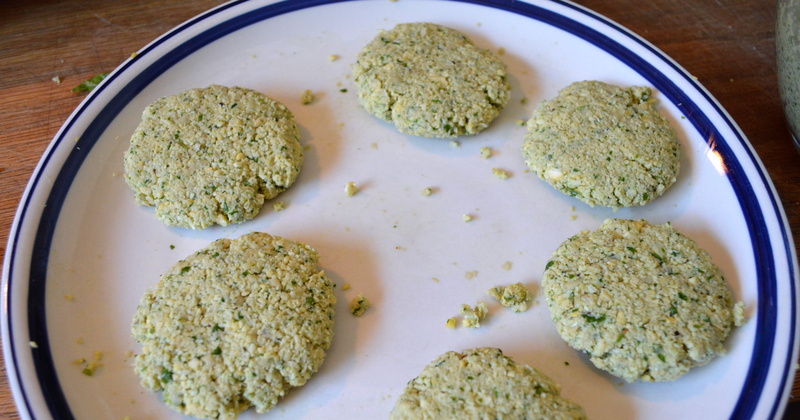 pull falafel patties out of oil and drain on rack or paper towels and add the next batch. To serve, place hot falafels in pita bread halves along with whatever condiments you like. I made a homemade tzatziki and added some chopped lettuce and tomato, keeping it real simple. The falafel patties were nice and crunchy on the outside and creamy on the inside. This made a ton of tzatziki, so if you don’t think you are going to use it all in 3-4 days then you might think about halving the recipe. Peel cucumbers, then cut in half lengthwise and take a small spoon and scrape out seeds. Discard seeds. If you’re using English cucumbers you really only need one and you don’t need to scrape out the seeds. Slice cucumbers, then put in a colander, sprinkle on 1 tablespoon of salt, and let stand for 30 minutes to draw out water. Drain well and wipe dry with paper towel. In food processor with steel blade, add cucumbers, garlic, lemon juice, dill, and a few grinds of black pepper. Process until well blended, then stir this mixture into the yogurt. Taste before adding any extra salt, then salt if needed. Place in refrigerator for at least two hours before serving so flavors can blend. The longer it rests the better it tastes. This keeps in the refrigerator for about 3 or 4 days. Make sure you stir it before serving. They turned out great for my first attempt. I didn’t mention that I had some left over cooked ones and reheated those one day and they weren’t bad. I also had plenty of falafel mix left and made a few more a few days later.